I just felt nothing special about today's bento. Perhaps the hot weather affected my mood drastically. I didn't have any inspirations at all for today's bento. The school catering is usually my savior if I don't feel or I don't have time to make bento for the kids hehehe ... Tomorrow they will have school catering for lunch. So out of my boredom I just made small onigiri decorated with nori. Inside the box were steamed flower shapes potatoes, steamed broccoli, stir-fry cabbage, yellow tofu, and tuna in tomato sauce. 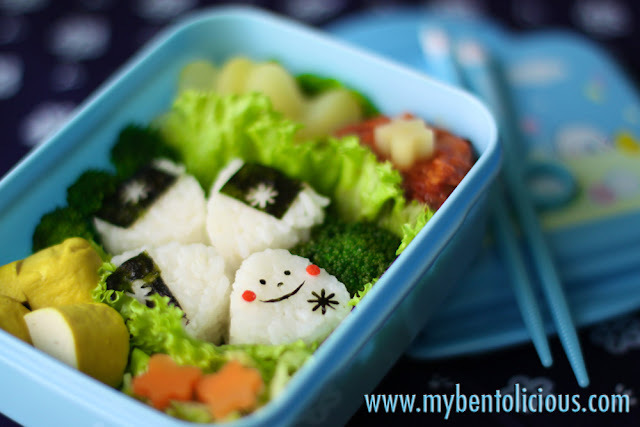 I think your bento are always adorable, even when uninspired! 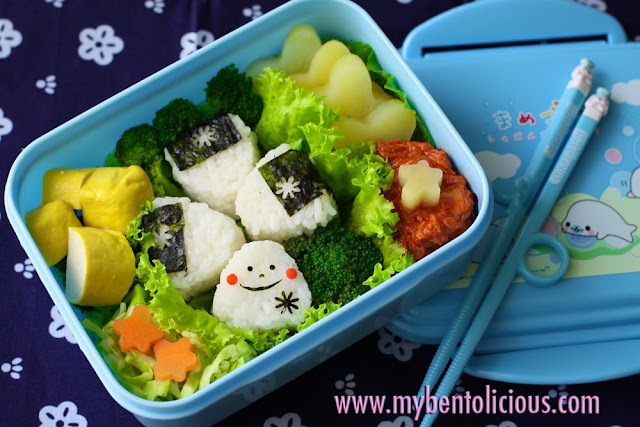 Your bentos are always so cute! Love the tiny musubis. I love your photography and all of the color combinations. Your bentos are always so fresh and bright.